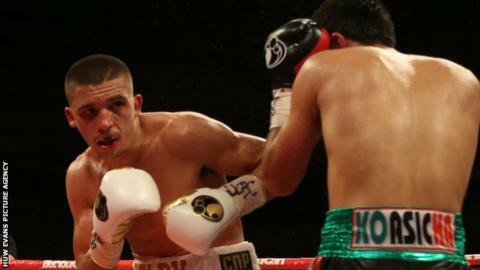 IBF featherweight champion Lee Selby aims to become a bigger name in America than fellow Welshman Joe Calzaghe. Super-middleweight champion Calzaghe only fought twice in the United States, beating Bernard Hopkins and Roy Jones Jr in the final year of his career. But Selby will make his first defence on USA soil against Mexican Fernando Montiel in Arizona on 14 October. International Boxing Hall of Fame inductee Calzaghe held the WBO, WBA, WBC and IBF super-middleweight belts, plus The Ring light-heavyweight title, during his undefeated 46-fight career. It's a record that Selby has the utmost respect for: "[Calzaghe] doesn't even look like a fighter, his face doesn't look like a boxer, there's few marks. If I can have a career half as successful as Joe's I will be very happy." But 43-year-old Calzaghe remains open to criticism - at least from the other side of the Atlantic - for appearing on so few promotions in the USA. Selby, 28, has some way to go to match Calzaghe's achievements, although in May he became Wales' 13th world champion by beating Evgeny Gradovich. The fighter, from Barry, near Cardiff, has shown his intent to break into the lucrative American market in a way that Calzaghe never did by signing up with recently retired champion Floyd Mayweather Jr's advisor, Al Haymon. "I will be boxing more in America now, I'll probably have three fights a year. Hopefully one of those will be back here in the UK," Selby said. "I want to be a worldwide star and to achieve that you have to fight over in America. There's other world champions at my weight: Leo Santa Cruz, Jesus Cuellar... they are the type of fights I want, the big fights. "You see what Al Haymon has done with Mayweather, the money he has made. He said if he was with Al Haymon from the start of his career he would be a billionaire. "I've never met Haymon, Chris Sanigar [Selby's manager] does all the negotiating. "Well there's a young lad from Barry Town. I'd like to be it."